Neolithic cultures based on agriculture and the use of stone tools appeared throughout mainland South-east Asia between 4000 B.C.E. and 1000 B.C.E. Bronze technology became widespread in the northern part during the second millennium B.C.E. and iron after 500 B.C.E. The expansion of settlements, the spread of agriculture and the use of metal technology were closely connected with the Neolithic cultures of southern China. The site of Ban Chiang was excavated from the late 1960s. Until then the period prior to the spread of an Indianized culture in the first millennium C.E. was relatively unknown. The finds at Ban Chiang and other sites clearly demonstrated that the prehistory of Thailand and South-east Asia was far more complex than had previously been thought. The site at Ban Chiang was occupied from around 3000 B.C.E. to the early centuries C.E. The earliest levels are agricultural but date before the use of bronze, which began to be used from around 2000 B.C.E. Burials with grave goods were excavated in addition to large quantities of decorated pottery in a variety of styles, for which the site is famous. 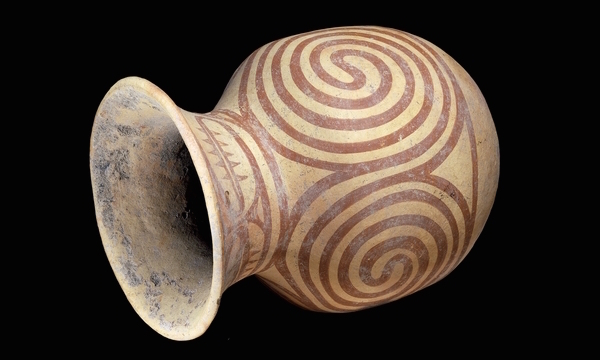 Elaborately decorated pots such as this one were produced in the first millennium B.C.E. A great variety of decorative motifs feature on this pottery including the red spiral patterns that densely cover the surface of this pot. These are similar to those found on contemporary pottery in southern China. Cite this page as: The British Museum, "Ban Chiang Clay Jar," in Smarthistory, February 28, 2017, accessed April 19, 2019, https://smarthistory.org/ban-chiang-clay-jar/.